Philips HTL1510 is a budget Bluetooth soundbar with wireless sub | What Hi-Fi? Philips is in the process of announcing a whole host of new products at its annual European convention, and this year that includes a new soundbar. 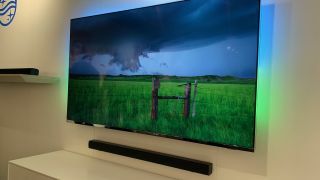 The Philips brand has been absent from audio products since the acquisition of the brand by TP Vision, with the new owners instead focusing on TVs. But it seems the Philips name will return to audio products in 2019. The first new soundbar is the Philips HTL1510, which seems to be part of Philip's Essential range. It's a 2.1-channel soundbar, which comes with a wireless subwoofer. There's wireless Bluetooth on board so you can stream music from your phone, tablet or laptop, as well as optical and audio inputs. The soundbar promises 70 watts of power and support for 'virtual surround sound'. There's no mention of HDMI, however.